We have a unique solution that will not only maximise your coverage across your office or building, but also help your business to become more productive, flexible and a create a desirable working infrastructure for your staff – internally and externally! We all live very much a mobile existence, including how we migrate with devices around our very own buildings. Even the deepest and darkest corner or the exterior spaces of a building now needs WIFI access, or if you’re site is spread across multiple offices, units, factory space and outside areas, WIFI has become a crucial requirement for communications. The initial WIFI survey is the most important part to get right when designing a wireless network. If you do not perform an actual onsite physical RF survey then the wireless network can only be guess work for gaining a coverage, and ascertaining capacity. Before we required the need to be mobile in our buildings, it was much easier to ascertain the WIFI requirements as they were purely designed for coverage. However, with a huge increase in laptops, smart phones and tablets, it is not about providing coverage, it comes down to capacity and capability of the network to perform. Using the latest industry tools and techniques to map out the RF coverage and capacity of your intended area for a new building, or existing area for a current office infrastructure, we can provide you with a detailed documentation on all aspects of the survey. They provide huge insight into how you can improve the WIFI coverage across your building. Capacity – is there enough capacity to handle the amount of users, and all of the various devices that want to tap into the WIFI network? A new network design will need to take into consideration your existing network, network policy and the demands of the business in future – future proofing the infrastructure! 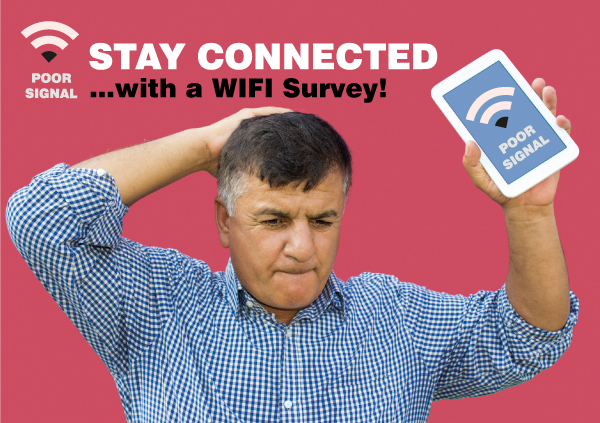 CONTACT US TODAY TO FIND OUT MORE ABOUT WIFI SURVEYS!